The Wheelock® Exceder HSR Horn Strobe incorporates high reliability and high efficiency optics to minimize current draw allowing for a greater number of appliances on the notification appliance circuit. All horn strobe models feature an industry first of 8 candela settings on a single appliance. Models with an audible feature 3 sound settings (90, 95, 99 dB). All switches to change settings, can be set without the use of a tool and are located behind the appliance to prevent tampering. Wall models feature voltage test points to take readings with a voltage meter for troubleshooting and AHJ inspection. 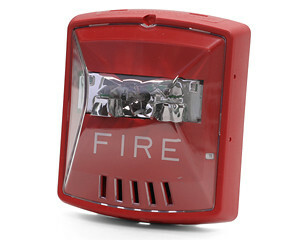 Both stylish and inspiring, architects and engineers can now specify the industry’s sleekest looking fire alerting notification appliance, while being afforded all the features and benefits that provide the industry’s lowest total cost of ownership.